So today, I ran out of conditioner. It was a really bad time to lack conditioner because I just got out of the pool. Chlorine just doesn’t do well with a colored hair! Bad combo! And so I scowled my cabinet for some emergency conditioner supply and found this! 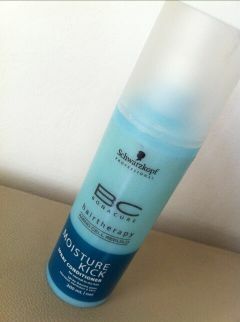 It’s a spray conditioner by Schwarzkopf BC Bonacure Hair Therapy. It’s the very first time I encountered a spray conditioner in my life and it works pretty convenient for me! All you need to do is do your shower routine. Shampoo your hair and rinse. On towel dried hair, spray the conditioner around. I used about 5 sprays. Don’t forget to shake it before use. It really surprised me that it worked pretty well. Â Without conditioner, my hair would usually be very tense and super tangled! Â But when I sprayed this on, I was able to comb easily. Â This tool is also perfect for people who are in a rush! Unfortunately, this can be only bought at Schwarzkopf places, they exclusively make this kind of product.